Disclaimer: Credits to Jaz Khai, Yeeing, Jackie and Johnnie Walker. Last month, I was lucky to get invitation for Johnnie Walker Circuit Lounge event. 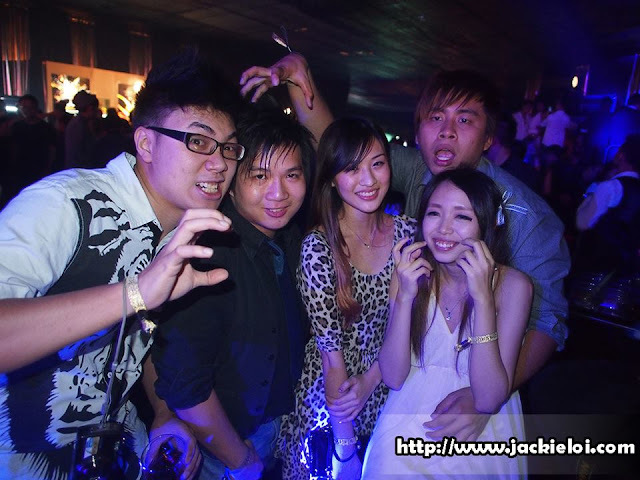 I know this is quite a late post but hey, this is my first time attending Johnnie Walker's event leh (support a bit ma). As you might want to know, Johnnie Walker Circuit Lounge was an exclusive gathering of A-list celebrities, leaders of commerce and privileged competition winners to celebrate the circuit race. As usual, premium whiskies were served such as Black Label, Double Black and Gold Label, with different taste of mixers. The night started with local DJ trios in KL, IMMA"BLEEP"YOUUP! and three of them does look like the "Fuk Luk Sau" (source). DJ Vogue Williams, a pretty Irish model spanned the deck with her remixes and had the crowd amazed with her tracks. Moving on, the last DJ of the night, DJ Ivan Gough ended the night with remixes of Swedish House Mafia's songs. Met this pretty, Jessy. She has a pair of long fair legs wtf -.- Envy to the max. Kinda wasted on Gold Label one because we didn't even open and try it out. Oh yeah, just so you might want to take a look on the pass.